Over 20 local bands will rock this year's NFL Draft. That includes Tim McGraw, Dierks Bentley, Moon Taxi, CeCe Winans, Mikky Ekko, and so many more. Check out the Main Draft Stage. View the NFL Draft Experience. The 2019 NFL Draft is happening in Nashville April 25-27. It's going to be the biggest show in Music City as young players find their professional home, fans play games and meet players, and more than 20 Nashville bands perform on multiple stages throughout the event. Download the Fan Mobile Pass app, your event guide and tool for unlocking great prizes and access at the 2019 NFL Draft in Nashville! Check out what you might need for the NFL Draft. You certainly won't go hungry in Music City. You're going to have a blast during the NFL Draft in Nashville. Looking to take something home? We have you covered. Check out the 22 prospects making their way to Music City for the NFL Draft. The Draft Main Stage will be at First and Broadway in downtown Music City. 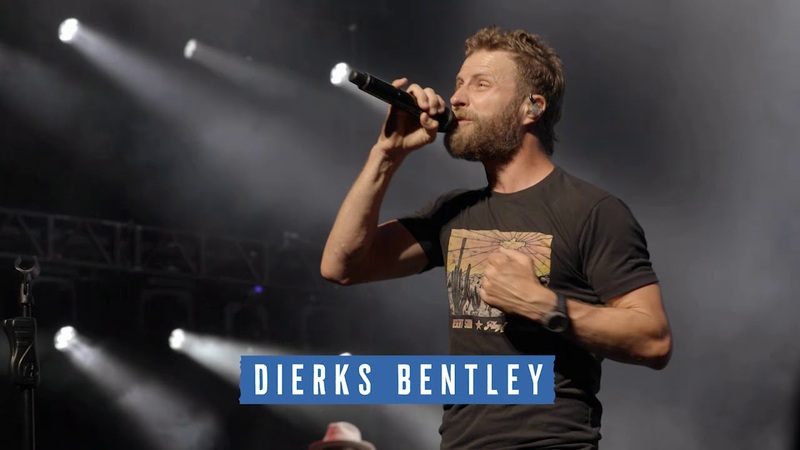 It's free and open to the public to view Draft selections and A-list concerts, including free outdoor concerts from Tim McGraw, Dierks Bentley, and Moon Taxi! Schermerhorn Symphony Center will be host to Selection Square, which features the team tables where representatives from each club will make their Draft selections. Selection Square will be open to the public 5-10pm on Thursday, April 25; 4-10pm on Friday, April 26; and 10am-6pm on Saturday, April 27. See full the schedule. NFL Draft Experience presented by Oikos® Triple Zero invites families and fans of all ages to enjoy a FREE admission, three-day football festival held at Nissan Stadium. 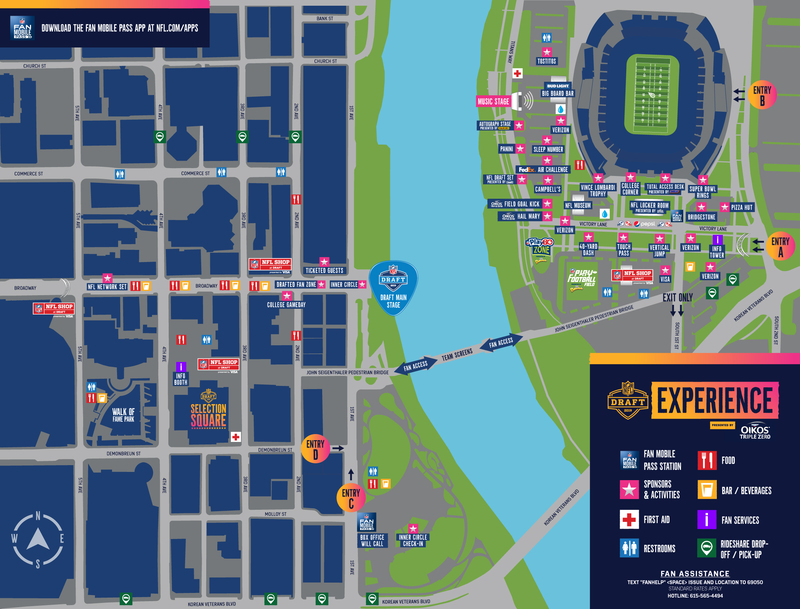 Representing the largest festival footprint ever created by the NFL, fans can participate in interactive exhibits, immersive games, virtual reality experiences, free player autograph sessions, enjoy live music from amazing Nashville bands, and more. GRAMMY-winning gospel music great CeCe Winans will sing the National Anthem to open NFL Draft activities on Thursday, April 25. The 2019 NFL Draft is not just about player prospects. It’s also about giving back to the city. The NFL’s Huddle Against Hunger kicks off in Nashville during the NFL Draft. As part of Huddle Against Hunger, the NFL will be partnering with Second Harvest Food Bank of Middle Tennessee to host a citywide food drive. Nashville and Middle Tennessee businesses will be called on to offer their locations as places for residents and visitors to drop off non-perishable food items. Food Drive will launch April 22, 2019 and wrap on Sunday May 5, 2019. To support the Huddle Against Hunger food drive please visit Secondharvestmidtn.org/NFLHuddle. Everyone will want to be in Nashville for the 2019 NFL Draft. Book your room today and secure your stay in Music City. Road trip through Tennessee on your way to Nashville for the NFL Draft. Visit tnvacation.com for Tennessee trip ideas and travel resources.